Bill Mauk is the founding partner of the Boise, Idaho law firm of Mauk, Miller, Hawkins PLLC, and its predecessor firms dating to 1995. 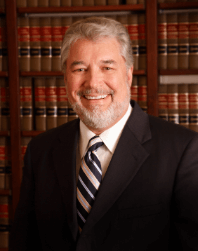 Bill has over 40 years of trial and appellate litigation experience, principally in the areas of employment law, personal injury and wrongful death matters, complex litigation, and disputes among owners of closely-held businesses. Over the course of his career, Bill has tried scores of civil and criminal jury trials, participated in 38 appeals to the Idaho Supreme Court and Court of Appeals, 10 appeals to the Ninth and Federal Circuit U.S. Courts of Appeal and two appeals to the U.S. Supreme Court. Bill is a past President of the Idaho Trial Lawyers Association, a former Chair of the Association of Trial Lawyers of America (ATLA) Employee Rights Law Section, and was on the Board of the Westerns States Trial Lawyers Association. He previously served as a member of the Idaho Governor’s Advisory Committee on Workers’ Compensation and as a Manager of the Idaho Industrial Special Indemnity Fund. He is a Diplomat of the National College of Advocacy, a past Co-Chair of the NCA Board of Trustees, and served on the ATLA/AAJ Board of Governors from 1997 to 2008. Bill Mauk earned his Bachelor’s degree from the University of Southern California, attended Cambridge University in England, and holds a Master’s degree in political science from Columbia University as well as a Juris Doctorate from the Antioch School of Law. Earlier in his career he clerked for Idaho Supreme Court Justice Allan Shepard, served as a Judge in the Shoshone-Bannock Tribal Court, and was an adjunct professor teaching Employment Law at the University of Idaho College of Law. In 2002 Bill received the “Civil Libertarian Award” from the Washington ACLU and the “Thurgood Marshall Award” from the Idaho ACLU for his work overturning the conviction of an Idaho death row inmate. In 2010 he was awarded the “James J. May Trial Lawyer of the Year” by the Idaho Trial Lawyers Association. Bill and his wife, Susan, met in law school. Susan currently works as a licensed professional counselor in private practice in Boise. They have two happily married sons, two granddaughters and one grandson. Bill and Susan enjoy whitewater rafting on the Salmon River, skiing Idaho resorts, fly fishing western streams, world travel to six continents and have attended five Summer Olympic Games. Offered legal services in New York to help victims of the September 11th attack in New York City (2001). Read this article to learn more.